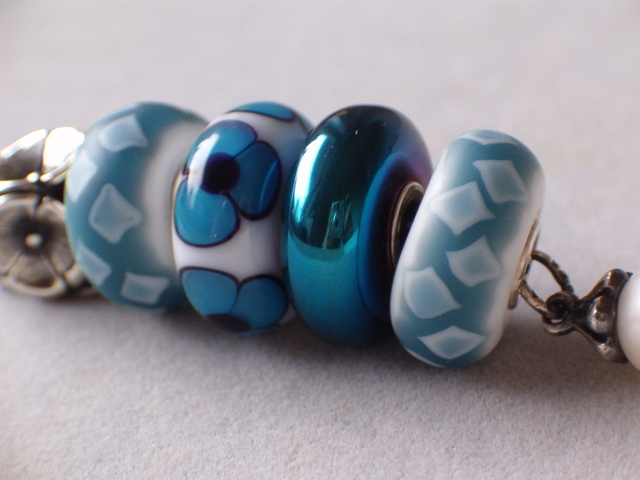 The coldest color I've seen in a bead so far. It will be perfect to cool down on hot summer days. Although I don't have many blue beads, it goes well in many existing combos and I like it with the Kimono beads on a FN. Wow!! Those combos are GORGEOUS! I love the hematite beads as well. I like it with the orange and I had been wondering how the hematite might work with the kimonos. The blue one seems to change it shade depending on which blues it is near. It does seem quite versatile! I really like it with the kimono beads and that flower! It looks really good with everything you have shown. I love these hematite beads! plenty of inspiration, thank you, they look so great on your combo! oh yah, nice oil slick there...do od is cute to boot too! What a beauty! I love the color and shine! It looks great with the Kimono beads and the Evil Eye Unique! 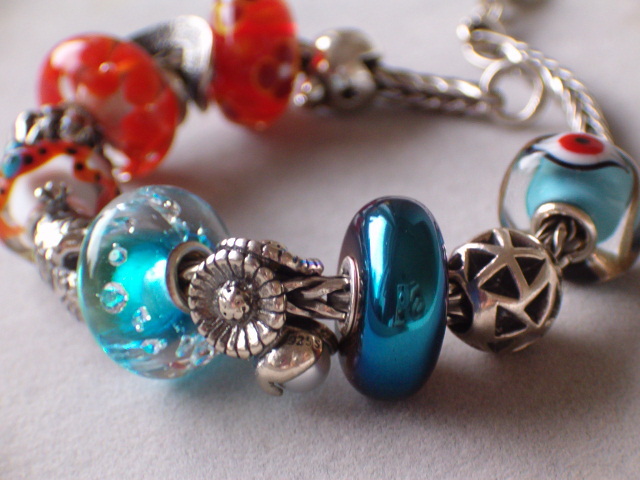 Love your oranges & blues - great beads & great combination! 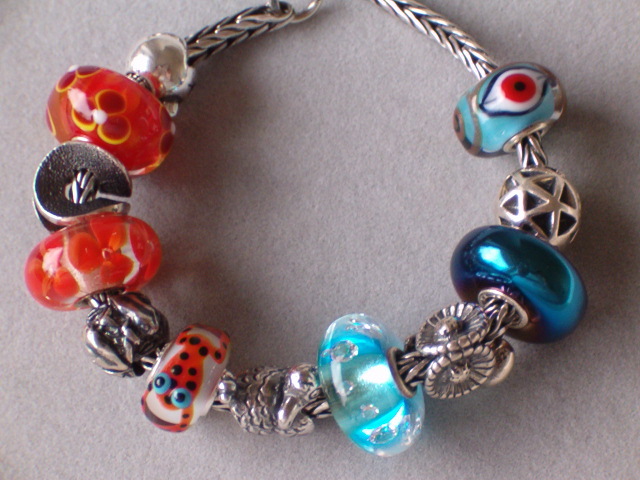 It is a stunning bead, and you have a gorgeous one, I wonder if there is even a bad one in the lot though. You have really illustrated the hot fire and cold ice contrast with the hot coral chili colors in the combo as well as the texture contrast with the kimonos. With that orange for the hot sun, the blues for the beautiful water and the hematite showing how the full moon shines off the ocean, I am absolutely ready to copy this, pack my bags and leave for vacation. I can't leave for a vacation right now but I can make a trip to my bead box. I'm surprised (in a good way) how the hematite goes with the Kimono beads. It appears that all my hematites are gray where the hematite has rubbed off. Does anyone know if these beads are solid hematite? I rubbed them with thee silver cleaning cloth and it doesn't do a thing. I wish they would be a little more detailed in their descriptions when they sell them. They have so much turnover of stores that you can never return them to who you bought them from. I hear you. Especially in the US many wonderful shops have closed during the last few years. But normally any shop should take them back (though it will probably be a bit awkward to return it to a store it was not bought from). Luckily I have had the same LD since almost the beginning of my collecting and so returning the few items in between that were faulty has not been a problem. If you cannot find an LD who will return it to HQ maybe you can contact TB HQ directly? I keep my fingers crossed that they will sort it out for you!